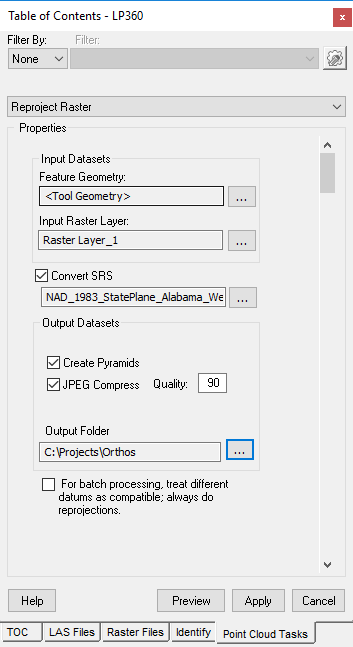 LP360 has a Point Cloud Task (PCT) that can reproject raster layers, create pyramids, and JPEG compress. The PCT is named Reproject Raster. When we reproject an existing orthophoto to a new coordinate system, or re-write to a different unit, the user can choose to output uncompressed, or JPEG compressed. If JPEG compression is selected, the user may select the q-factor (quality factor: 100 highest quality/least compression, down to 1, lowest quality/most compression). The user can also choose to make overviews (pyramids). When making overviews, we use 2×2 averaging as the pre-filtering method, before decimating. This entry was posted in AirGon Tools, Tips and Workflows, LP360 Tools, Tips and Workflows and tagged Compress, JPEG, orthophoto, raster, reproject.